Happy Thursday! We’re one day closer to Friday! And that’s not the only good news. At least, that’s what I thought. Don’t get me wrong; I think Barbie is a great toy and I absolutely LOVED dressing mine up and acting out plays with them. I also really like that Barbie has had 130 different careers, showing girls that anything is possible! However, I do think there’s room for improvement. And that’s why I was so excited when I read an article from The Telegraph! Mattel has decided to add new dolls to their Barbie line! There will be three new body shapes as well as new skin tones and hairstyles! How exciting is that?! Now little girls everywhere can find a Barbie that looks like them! I truly think this was an awesome move for Mattel. What do you think about the new Barbies? Share int he comments below! On Monday, I talked about GoldieBlox and their awesome Super Bowl commercial. I wasn’t sure exactly what GoldieBlox did, so I looked into it. They are a start-up company that makes engineering toys for girls! Since about 80% of today’s engineers are male, their founder, thought that needed to change. So, she created GoldieBlox! This got me thinking: what other toys are out there to encourage a love of math and science in girls? Look at these AMAZING toys to get our girls excited about math and science! There is a Science Fair at school and Lottie decides to research if it is possible to build a robot using only recycled materials. It is hard work, but fun and exciting too. Maybe if the robot is really good it can even help her to tidy her bedroom and do the household chores! 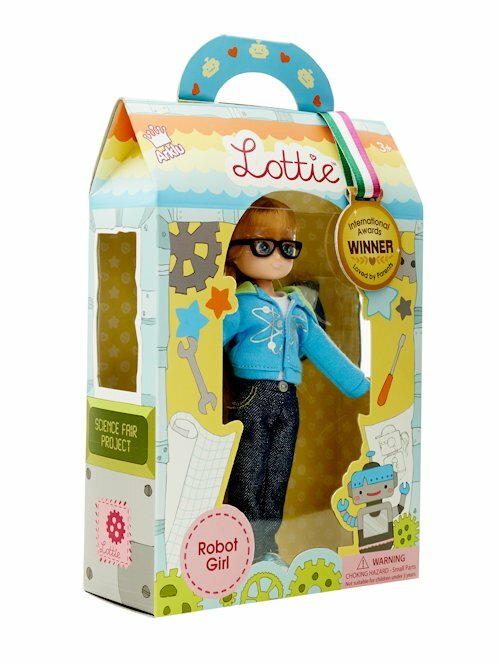 It is lucky that Lottie’s bedroom is so messy as she discovers a heap of useful things she can reuse and recycle to build her ‘Busy Lizzie’ robot; even some old shoes. Will Lottie’s Science Fair project win a prize? But the creme-de-la-creme is from an awesome site called A Mighty Girl. Their mission is to ” provide the world’s largest collection of books, toys and movies for smart, confident, and courageous girls.” So great, right?! You’ve GOT to check out their collection! What about you? Any products you love for your little Madame Curie?